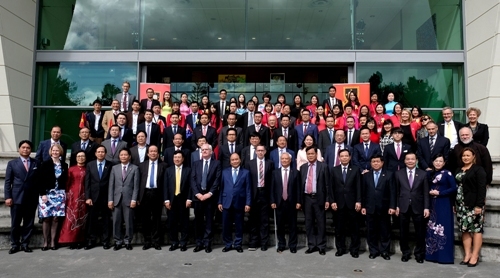 PM Nguyen Xuan Phuc on March 14 visited the University of Waikato and joined in a dialogue with students on the sidelines of his official visit to New Zealand. Speaking at the event, the PM asserted that the development of high-quality human resources is one of three strategic breakthroughs to become a modern industrial nation in the future. Regarding the prospects in the two nations’ cooperation in education and Viet Nam’s policy to attract Vietnamese students after they finish their overseas study, Mr. Phuc asserted that prioritized policies will be proposed to attract talent Vietnamese students, adding that a Decree on attracting talents was issued. Talking about economic prospects for the two nations when the Comprehensive and Progressive Agreement for Trans-Pacific Partnership (CPTPP) was inked, the Vietnamese leader highlighted that the Agreement will open a new chapter in the relations between its country members as it comes into effect since 2019. Viet Nam and New Zealand will promote cooperation in their advantageous areas and launch specific cooperation, he said, adding that the CPTPP will open a bright future for comprehensive cooperation heading to the two sides’ Strategic Partnership as well as facilitate the development of its 11 members, especially Viet Nam and New Zealand. In the context of the fourth industrial revolution, the PM stressed that Viet Nam has realized information technology strategies including the development of IT infrastructure and training IT human resources. PM Phuc witnessed the signing ceremony between the University of Waikato and the Viet Nam Social Security, Viet Nam National University, Ha Noi University of Science and Technology and Ha Noi University. Currently, as many as 3,000 Vietnamese students are studying in New Zealand, ranking ninth among the foreign students there. The University of Waikato is a comprehensive university in Hamilton, New Zealand. It was established in 1964.